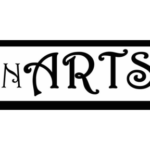 The 5th annual Joplin Arts Fest is Southwest Missouri’s premier fall fine arts festival. This juried event showcases exceptional talented 2D and 3D artists exhibiting their original artwork. The festival will once again be held in Joplin’s beautiful Mercy Park. This park is located at the corner of 26thand McClelland Blvd (physical address is 3002 St. Johns Blvd). The art festival will be held on Friday evening, September 20, 2019 from 6PM to 10PM and Saturday, September 21, 2019 from 9AM to 4PM. This year’s patrons’ program will include a patron-artist reception from 5PM to 6PM on Friday evening. Booth spaces of 12’ x 12’, are $100 which includes electricity and the cost of a Joplin City business licenses. Artists are required to provide their own tent (white tents are strongly encouraged) for the festival. Overnight security will be provided for Friday night through Saturday morning. However, each artist must be able to enclose his/her tent during this overnight period. The Joplin Kiwanis Club in conjunction with the Joplin Regional Artists Coalition (JRAC), Connect2Culture (C2C) and Spiva Center for the Arts are once again be hosting the festival. Team Dental of Joplin will be this year’s Event Sponsor. All funds raised by this festival will be used by the Kiwanis Club of Joplin to support a variety of youth related programs in the Joplin area. ALL ARTISTS: PLEASE READ THIS CAREFULLY TO AVOID MISUNDERSTANDING. Email or call with questions. IMPORTANT: All work exhibited must be created by the applying artist in his or her own studio. There are very limited exceptions. Commercially-produced items bearing your art will be permitted as long as it does not take up more than 10% of the artist’s booth space. Examples include coasters, cutting boards, mouse pads, drinking glasses or mugs, books, etc. If you have questions, please call the co-chair for clarification. Lab-produced note cards are permitted in limited amounts if the images reflect the photography, painting, drawing, etc., that was juried. One card stand is permitted within the confines of the booth and must be shown in the booth image. Joplin Arts Fest reserves the right to consult with the artist on fixtures in the booth before invitation acceptance. A limited number of lab-produced reproductions of original art are permitted. Work submitted for jury must be completed within the last 3 years. This is a juried show of fine arts—see media categories listed below. The jury will select those artists whose work demonstrates originality and quality. All work must be created by the displaying artist. Giclees/prints of original work may be exhibited in your booth, marked clearly as reproductions. These items may not include more than 25% of the work on display in the booth. Prints placed on cutting boards, tiles, cups, etc. are limited to not more than10% of the booth space T-shirts, or other such clothing items are not allowed. If you have questions please contact the festival co-chair. No-resale, market or commercially made items will be allowed. If any items are not original work, do not match the quality and/or description of the juried item(s) or any additional items not previously juried, festival staff will request removal of those items and/or the exhibitor may be asked to leave the festival. This decision will be at the discretion of the festival chairs. No fee will be returned. Any items that are not works of art for sale or part of your booth display must be hidden from attendees’ view. We are looking for a very clean, organized, gallery-type booth display. In some cases, the back and/or side of your tent may be visible; please plan to keep this area uncluttered and clean. All artist spaces must be set up and ready for sales 30 minutes prior to the opening of each day of the show. All displays must be within the booth. If you believe your display cannot fit within the booth, please contact the co-chair. All artist spaces must remain open until 10:00 PM on Friday evening and 4PM on Saturday with take down starting only after 4:00 PM on Saturday afternoon. This is a family-friendly show; no works of an explicit nature, please. In addition to the fine arts booths, there will be a stage for performing arts activities. These performances will take place during the festival as a means to complement the event. Create your space! Here suggestions to make your day successful. Just a friendly reminder that pickup of Arti Gras artwork is scheduled for Sunday, March 17, from 2 to 5pm at artCentral. Anything remaining after this time will automatically rotate into one of artCentral’s two satellite galleries, Sirloin Stockade and the Carthage Public Library. This is an excellent opportunity for the membership to receive additional exposure and will run from late March to late May. Any artists who specify that they do not want their work to go to the satellites, but fail to pick up their work during the designated time will be charged a $5 per day storage fee. Members who sold work during the show will receive checks in the mail from artCentral for their sale price minus a 25% commission. Here are the February 2019 Minutes from the most recent JRAC board meeting. Note that we elected a new president, Emily Rose, a Carthage painter and active volunteer with artCentral. Laura Lowry-Greene, who operates Maple Uncommon Guest House and Gallery, host of an annual JRAC exhibit, was elected vice president. I was re-elected secretary and Daria Claiborne will continue to handle treasurer’s duties. Otherwise, keep the creative juices flowing! CALLING ALL ARTISTS! MSSU UPCOMING “FAKE NEWS” SHOW (SEE BELOW). DEADLINE IS FEBRUARY 8TH, 2019. EMAIL ENTRIES TO BENTLEY-C@MSSU.EDU. PLEASE SHARE! Divisive, diverse, inflammatory- politics can’t be avoided and they are often difficult to navigate. Propaganda, laden with political slogans, on all sides, adds more ambiguity to the mix. Our political opinions, and those intrinsic beliefs, shape us, and our responses to the political chatter. This show seeks pieces that respond to the theme “Fake News”. We are open to all interpretations of this theme. This is regardless of political party or belief system. The artwork can be literal, figurative, interpretive, etc. This is an open call- to all mediums. We value all beliefs and the manner in which these can be expressed artistically. The main criteria is that the artwork responds to the theme “Fake News”. Any artist 18 years of age or older is encouraged to enter. All media will be considered, including video. No ceiling hung installations will be accepted. Submissions must be made via email by midnight on Friday, February 8. For sculptural work, please provide 3 high resolution .jpg photos (300 dpi) with the name of the file following this structure: firstname, lastname_01. For video work please send a .mov or .mp4 file, or a link to view the full file. If there are specific installation instructions, or equipment necessary for installation, please include those in the submission information document as well. Ceiling hung, or work with overly complex installations needs, will not be accepted. All work must be able to pass through a standard, single doorway and is limited to 75 lbs. All artwork must be ready for display upon submission. If your work is accepted, shipped work must arrive at the MSSU Spiva Gallery no later than 4pm, Tuesday March 12. Hand delivered work can be dropped off from Friday, March 8- March 15th, 8 am-5 pm. Accepted work must be ready to be hung or displayed in a professional manner. Artists are responsible for shipping costs both ways with the return shipping paid for ahead of time. Pack securely. No use of Styrofoam packing pellets (bubble wrap is acceptable). No glass on framing of wall-based work, Plexiglas only. Work that arrives at gallery damaged will be returned un-displayed. The MSSU Spiva Gallery is not responsible for work damaged in transit. At the exhibitions conclusion, work will be packed by the MSSU Spiva Gallery in the shipping containers they arrived in, and returned promptly to the artists in late April, 2019. Pick-up of work will be on Saturday, April 20, 2019 from 10 am-2pm. MSSU Spiva Gallery will not store work past the pick-up time. Work does not have to be for sale. Sale prices are determined by the artist. 100% of sale price goes to the artist. All work must be the property of the artist in order to be available for sale. MSSU Spiva Gallery does not provide insurance for any piece during the “Fake News” show, though great care will be taken in handling your work. MSSU Spiva Gallery recommends the work be insured during shipping, as the artist bears the full responsibility for loss and damage to art while in transit. By entering the competition, selected artists grant MSSU and the MSSU Spiva Gallery rights to use the selected image(s) on printed materials and the gallery web site for promotional purposes only. Below are the the answers of the 5 candidates to the questions that were submitted to them. We hope that this will give you some insight into the individuals running for the JRAC Board of Directors. For PDF Version Click here. Each of the candidates was asked to respond to seven questions. Below, you will find their responses. This should give you some insight into each of the individuals running for the JRAC Board of Directors. How long have you been a member of JRAC? I have been a member of JRAC from the beginning. What is your artistic medium and/or your involvement in the local artists community? I have dabbled in Jewelry and Mixed Media. I currently prefer Fiber Arts. What strengths would you bring to the board if you were elected? I would bring my organizational skills and my communication skills to the board. I would like to increase the social media presence through Facebook and Instagram. Why are you interested in being a member of the JRAC Board? I feel that as an artist and member of the artist community, we all need to invest our time in strengthening the local arts. Part of that is serving on boards and committees. I think serving on the board will give me a better understanding of how much time and effort past board members have given to JRAC. If we all can just do a little, then it eases the burden of a few taking on the whole responsibility. Working a full time job with my art business and family life, I want to set an example for others that even a little time and effort is appreciated. What do you believe are the current strengths of JRAC ? The fantastic shows that JRAC provides or are in partnership with. What would you like to see JRAC do that they are not currently doing? Increase active membership. I would like to see the Website updated on a regular basis and artist bio’s and pictures updated. This could be JRAC BOARD CANDIDATE INFORMATIONused a great resource for promoting JRAC. How long have you been a member of JRAC? I’m not sure-a couple of years. What is your artistic medium and/or your involvement in the local artists community?. My main medium is clay, though I paint as well. I have additional involvement in the art community via Spiva Center for the Arts. I have been a member there for years and am the Volunteer Coordinator. I work the front desk once a month and oversee all of the volunteer scheduling. I have been a longstanding member of Midwest Clay Artists and Springfield Regional Arts Council, as well as a Juried Member of Best of Missouri Hands. What strengths would you bring to the board if you were elected? I have a previous history as an Human Resources Professional and that has given me strong attention to detail, writing policy and procedure and contractual documents, and organizational skills. I have found that some of the things I used daily in my previous career serve me well in the art world. Because I am represented by several retail situations, attention to detail and being organized has been crucial. I believe being organized would be helpful in assisting with a wide variety of events with JRAC, especially all of the exhibits we participate in during any given year. Why are you interested in being a member of the JRAC Board? I am interested in becoming a member of the board for the simple reason of doing my part. In so many organizations, a lot of the work falls to a few. I am now in a position to be able to offer some time to help in the tasks that allow JRAC to run smoothly and continue to be a visible representation of the wonderful art in the area. What do you believe are the current strengths of JRAC ? The strengths of JRAC-we have such a diverse grouping of artists, from mediums to skill levels. Welcoming everyone allows for the seasoned artists to mentor the new artists and the new artists to remind the seasoned artists that there is always something new and exciting to learn. JRAC has also been a tremendous voice in the area regarding the arts. By hosting multiple exhibits every year, we are consistently reminding the general public that Joplin has a wonderful wealth of art and culture, and hopefully inspiring the next generation to consider the arts as a career path. What would you like to see JRAC do that they are not currently doing? I’m not sure that I can list something that JRAC isn’t doing at this time. We have such a positive presence in Joplin with several different types of opportunities for our members to exhibit, meet, learn, and teach that I’d be hard pressed to offer any suggestions. 2. How long have you been a member of JRAC? I’m not for sure how long it has been but I have been a business member with JRAC since the beginning. 3. What is your artistic medium and/or your involvement in the local artists community? I am a local Joplin business that works with artists on their scanning and reproductions of their original artwork. Also printing of giclees and custom framing of pieces. 4. What strengths would you bring to the board if you were elected? The strengths that I can bring to the board are maybe some new ideas and/or concerns from the business side of the art world. 5. Why are you interested in being a member of the JRAC Board? Honestly, Andrew Batcheller sweet talked me into it. I really had never thought of being on the board before he mentioned it, but I think that it would give me a better idea of how to best work with our local artists and what they are looking for to advance their businesses. 6. What do you believe are the current strengths of JRAC ? I think the main strength of JRAC is the fact it is a great resource for artists in the area. Also a great place for artists to be involved with each other when they might not normally be. 7. What would you like to see JRAC do that they are not currently doing? I am not sure of anything you aren’t doing at the present time. How long have you been a member of JRAC? As just a bit of background, I have been a Joplin resident for over 50 years, heavily invested in the community through many organizations, and employment with Ozark Nursery for several years; finally owning a retail bead store (Isadora’s Wonderful Things), teaching many classes as well as speaking to local groups. For the past 5 years my column, Speaking of Gardens, has been featured in the Joplin Globe, winning the Missouri Writers Association award for best newspaper column of 2018. 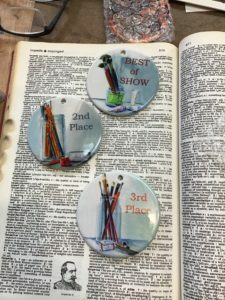 I have been an off-again, on-again member of Spiva Center for the Arts, once winning an award for a piece of beaded art jewelry in a members’ show, and a member of JRAC twice. The first time my schedule and the JRAC meetings didn’t work well together, and I dropped the membership but once again joined in 2018, to become more involved in the Joplin art community. What is your artistic medium and/or your involvement in the local artists community? It’s hard to nail down an art medium for me; as I’ve said, I’ve seldom met a medium I didn’t like. I started out as a child with pencils and paint, branching out into whatever caught my fancy. In my adult life I’ve done (and still do) pen and ink, pencil drawing, calligraphy, painting with various mediums, art needlework, woodcarving, sculpting, art beadwork, mosaics, and leatherwork, to name a few. For the past year or so I’ve gone back into pencil drawings and acrylic paints, improving my skills and always learning new methods and exploring new ideas. I’ve been involved in many craft shows and events for most of my life in Joplin, but only recently have become interested in presenting my work at galleries and shows as the next step in the progression of my journey with art. What strengths would you bring to the board if you were elected? I believe I have several strengths too bring to JRAC. I’m pretty good with words, and full of ideas (occasionally some good ones) and like looking at all sides of a question. I have a good understanding from years of experience what goes into artwork and the value of it as well as appreciation of the works of other artists. I’m always willing to help with organization and set up of shows and events, though at this point, being fairly new to how the area art world works and not familiar with protocol, I don’t feel qualified to locate venues and organize actual events. Why are you interested in being a member of the JRAC Board? 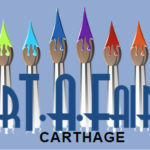 As a new-ish member of JRAC (though I have known several members previously) I find it to be welcoming, and helpful to its members in notifying about upcoming shows, answering questions, walking through the necessary steps and opening up opportunities for local artists to show their work and be recognized. Last Saturday coffees offer good exchanges of ideas as well as socializing and getting to know other artists. Events like this are where ideas begin. I do wish attendance was better; perhaps more board members could attend and maybe we need reminders a week in advance. What do you believe are the current strengths of JRAC ? I believe I have several strengths too bring to JRAC. I’m pretty good with words, and full of ideas (occasionally some good ones) and like looking at all sides of a question. I have a good understanding from years of experience what goes into artwork and the value of it as well as appreciation of the works of other artists. I’m always willing to help with organization and set up of shows and events, though at this point, being fairly new to how the area art world works and not familiar with protocol, I don’t feel qualified to locate venues and organize actual events. What would you like to see JRAC do that they are not currently doing? Not having been a member long enough to know what JRAC should be doing, I don’t really have an answer to that question as yet. I would like to learn more about it, listen and observe, have answers to my questions from more experienced members, and weigh thoughts presented by others before I can give my own definite answers. Joplin has come a long way with art awareness in the last few years, and I would like to see JRAC working to further that interest in the community. 2. How long have you been a member of JRAC? I have been a member for three months. 3. What is your artistic medium and/or your involvement in the local artists community? Though I dabble In many mediums, I primarly work as a ceramists and painter. As for my involvement in the community, I hold memberships with Spiva, Art Central, Midwest Clay Artists and of course JRAC. I have also participated in various local events and have most recently sold my work at Empire Market. 4. What strengths would you bring to the board if you were elected? I am driven to succeed as an artist, therefore I am dedicated to putting in the time and energy it takes to build my artistic skill as well as researching and implementing ways to share and market my work, both in person and through social media. 5. Why are you interested in being a member of the JRAC Board? 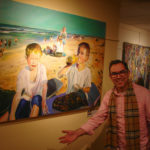 I believe it is important to serve, support and connect with my fellow art lovers. Together we make our world much more interesting. 6. What do you believe are the current strengths of JRAC ? JRAC offers great opportunities for artists to showcase their work and network, as well as inform members of events and activities. 7. What would you like to see JRAC do that they are not currently doing? JRAC could take greater advantage of social media. We’re gearing up for another great JRAC show at artCentral…mark your calendars for the January 27 art drop off at artCentral from 2 to 5PM! The opening reception will be on February 1 from 6 to 8PM….we have cash prizes waiting in the wings for the best work. Instead of the customary ribbons this time, we’re offering amazing recognition medallions created by Michael Steddum (see attached pic). You want one of these! One factor in the success of last year’s Art Speaks show was the lovely Bubble Wrap painting generously offered by Michael Steddum as a door prize. Raffle tickets were offered during the entire show to raise money for both artCentral and JRAC. We’d love to continue the tradition this year. This is a great opportunity to make a difference and get some additional exposure for your work. And of course, we’ll be sure your gift to benefit our local art organizations is given all due credit and publicity. Please email joplinrac@gmail.com with an image of your work and the dimensions ASAP. Many thanks for your support. Let’s make this the best show ever! A motion was made by Steve Doerr and seconded by Laura Lowry-Greene to accept the minutes of the December board meeting. The motion was unanimously approved. Marta Churchwell presented a report on the December JRAC Coffee Talk. She noted that it included a brainstorming session on suggestions for JRAC activities for the coming year. They included expansion of exhibits into Northwest Arkansas with member contacts available for this in Bentonville and Eureka Springs; a themed exhibit focusing on local/area history, perhaps Route 66; and a “re-homing” sale of artwork that artists have been unable to sell or no longer want. Emily Rose reported that the most recent issue of the newsletter was sent out. It was noted that the deadline for members to submit information on their exhibits or other art activities is the 25th of each month. The information may be submitted to joplinracnews@gmail.com. The date for drop-off for artwork for the artCentral JRAC Membership Show was set for 2 to 5 p.m. Sunday, Jan. 27, at artCentral. Brenda Sears Hayes and Laura Lowry-Greene agreed to help process the entries during the drop-off. Pickup of artwork from the exhibit at Buttonwood Art Space was set for 1 to 3 p.m. Saturday, Feb. 2, at Andrew Batcheller’s studio at 21st and Connor. The next meeting of the board is set for 6:30 p.m. Tuesday, Feb. 12, in the conference room of the Joseph Newman Innovation Center, 407 S. Pennsylvania. I’d like to take a moment to thank all of our members who attended our Delightful show at Buttonwood Artspace last evening in Kansas City. We all had a terrific time and the winners were…. (drumroll)…..Honorable mention number one went to Marian Chamberlain for “Regatta”. 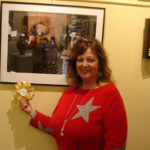 Honorable mention number two was Linda Teeter for “Seattle Coffeehouse”. Third place went to our much loved and appreciated Connie Miller for “Blue Noir”. Second Place honors went to Brad Brackin for “Summer Youth”. 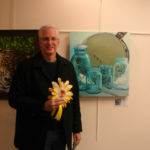 And the Best In Show ribbon was awarded to the SUPREMELY talented Michael Steddum for “BlueGlass”. We would like to thank all who participated in such a tremendous and well-received show. And just a quick reminder, all work is to be picked up for our show “Joplin Inspired” at Spiva next Saturday the 15th from noon till 2pm at Spiva upstairs.